Usually when a tree care service, sawmill or custom woodworking business takes a shining to urban wood, the owner sets out to forge a network to sustain his business. 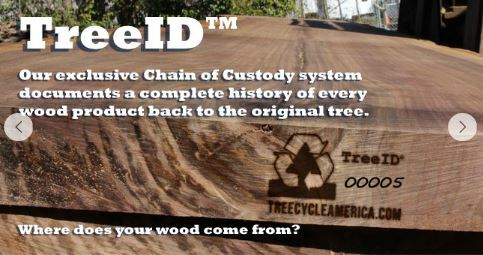 One of the novelties of Treecycle America’s Market, is its TreeID chain of custody system. It allows consumers to view the map and history of the trees used to create products. The product mix includes kiln-dried lumber, live edge slabs, furniture, fireplace mantels, DIY kits and handmade artisan crafts. Damon Barron, co-founder of Treecycle America, was a featured speaker at the 2015 TEDx conference in Charlotte. The TED conferences are infamous for featuring speakers at the forefront of the convergence of Technology, Entertainment and Design. Each speaker is required to present their topic in 18 minutes or less. Barron accomplished his spiel in less than 12 minutes based on the video below.